Allow me to introduce you to what may have just become my new favourite beer. It's called, "La Fin Du Monde," which is French for "The End of the World." This fine pale ale is the product of Unibroue in Chambly, Quebec, Canada. According to their website, La Fin Du Monde has earned "more medals and awards, including some of the world's highest honors, than any other Canadian beer." Those are some pretty amazing bragging rights. 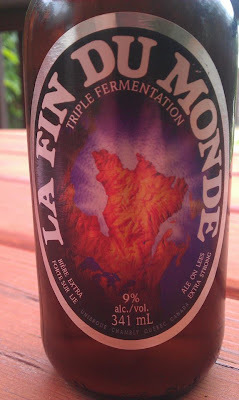 At 9% alc./vol., La Fin Du Monde is clearly stronger than most and as such, is clearly not for wimps. As a matter of fact, it is twice as strong as a lot of beers out there, so technically speaking, you probably can only handle about half as many beers as you normally might drink. La Fin Du Monde may be a little harder to find than most, but if you come across it somewhere, you owe it to yourself to at least pick up a six-pack and try it. 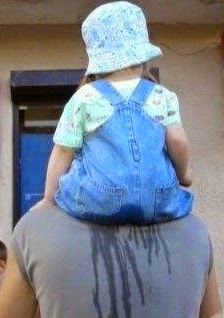 But be warned: If you do, you may never really be satisfied with the run-of-the-mill swill's again. At least that has been my experience. Well there you have it. A big thank you to my son Nick for introducing me to this awesome Canadian beer. I will be sure to have some in the fridge next time you come for a visit, Nick.